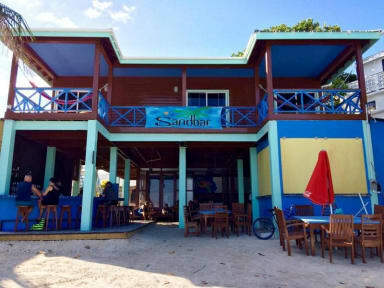 Sandbar Beachfront & Restaurant is a thrifty traveller’s/backpacker’s dream come true. Located in San Pedro on Ambergris Caye, we are on the water and priced for even the most budget conscious. Our bar and restaurant will keep you full of pizzas and rum! We are located on the beach, a five minute walk to the center of town. We are in the Boca Del Rio part of the island named Ambergris Caye in Belize. Our island is a 90 minutes by boat ride from Belize City and is the main tourist destination in Belize. We are a 10 minutes walk or 3 minutes taxi cab ride from the airport. Go north from the airport until you get to the traffic circle and go right to the beach. Then make a left and we are the second property on the left. 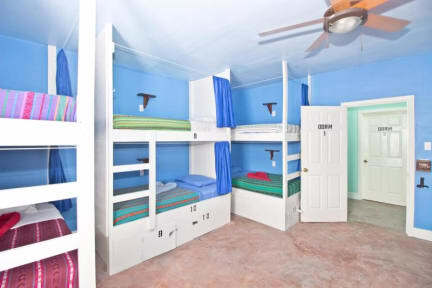 Each bed comes with its own locker, privacy curtain, shelf and electrical plug! The rooms are on the second floor over our restaurant/bar. Air Conditioning is standard and free WiFi throughout. Downstairs we have free bottle water refills, microwave and refrigerator for your use! No show or Cancellation with in 7 days will result in charge in FULL. Perfect location. Great staff. Excellent atmosphere. Awesome hostel - I think we caught it on a slow few days as there weren't many people around, however great hostel experience. Had a blast staying here. Close to markets, dining, drinking, golf cart rentals, shopping, and the sea! Took the day snorkeling tour hosted through the hostel and it was a great time. Perfectly located. Lively atmosphere but will still allow you to sleep at night. Stayed one night and extended our stay because we had a good sleep and there was hot water! Staff was very accommodating and helpful. Would definitely recommend! Sandbar was a great place to stay; conveniently located and easy to get to. Check in was simple, no problems whatsoever. AC in the bedrooms were a plus, beds were comfortable, available storage, and free wifi. The one downside to this hostel was the bathroom. Water pressure became worse as my four day trip proceeded, at times even cold, and the bathrooms were just in general not always kept up with. Staff were nice if a question needed answering. Best features are a great location and atmosphere. Downsides are no kitchen and no place to put your stuff in the dorms shower area. Being as it is a beach location, and the entire bar and lounge area is on the sand, it could use an area to rinse and hang clothes. There's no separate area from the bar restaurant for guests to bring food from the grocery store it feels a bit awkward. That and to ask to borrow something from the bar. It definitely feels like they want to sell you their food. Great location but didn’t have the greatest hangout area to meet fellow travelers. Loved having a dock to sun bath and swim off and also really appreciated the air conditioned dorm rooms and hot water! Staff wasn’t super welcoming and didn’t try very hard to socials with the guests, but maybe that was just my experience. Otherwise I had a great stay! The rooms had air conditioning all day which was good. The beds were ok. No kitchen available which is awful. The breakfast in the bar is expensive but you dont have any other option. The rooms are open to anyone outside of the hostel which can facilitate burglary (the access is on the side and no keys are required). This place was alright. The beds were great, they had curtains to offer privacy and a ton of storage space underneath. The room had AC which was a big win. However, security to get into the rooms was basically non-existent. The doors didn't lock or anything, and while I never felt unsafe per se I still thought it was an oversight. The girl's bathroom needed improvement. Only two showers without changing spaces and barely any water pressure. But this is probably the best you'll find in San Pedro.